Sicario director Denis Villeneuve and cinematographer Roger Deakins, who helped make the first one feel so special, are absent this time, but Stefano Sollima and DP Dariusz Wolski still hold their ground to create beautiful production and violent sequences that nearly hold up to the first one’s glamour. The sound editing is harrowing and elevates the terror of sequences that could feel like real-life combat, and the gunfight choreography and use of blood to elevate terror are fitting. Like the first film, even with a slight amount of violence the stakes can be gripping, which is strong for a world with movies filled with loud sound effects and explosions. Even without Emily Blunt, the cast is great, particularly Benicio del Toro once again as a complex lead who isn’t all heroic and also dark at times. Josh Brolin also has a great return as a man trying to get the job done, and this actor never seems to disappoint or perform under your expectations, as he’s able to embrace every one of his performances to the fullest. Some of the powerful writing from the first film is present — like exploring the children of drug lords and their experience in the crosshairs. Like its predecessor, Day of the Soldado is very well-shot, with night vision scenes to intense shootout sequences in the desert, and the music is as awe-inspiring as in the first. However, there are some scenes that feel unnecessary to the plot or don’t lead to many places, and the movie introduces some great ideas in the first two acts that are ignored towards the end. The ending feels like its teasing what could be next in Sicario 3 which is fine but it ends a little too abruptly to be taken in. I’m glad it’s unpredictable and well made like the first movie but it doesn’t feel as motivated and suspenseful, and it hardly felt like a complete story because a little too much was left open for the next movie and there wasn’t edge of your seat tension and shock in the climax or most importantly emotion like the first film’s insane final minutes. 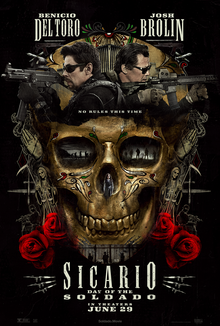 It’s still got a dark story and themes like the first one that work very well, and holds its ground in terms of style, but in the end never justifies its existence other than promising a hopefully better Sicario threequel. Sicario: Day of the Soldado feels as well-done and harrowingly violent as its predecessor, with great performances as well, but doesn’t completely embrace its themes and saitsfy in terms of substance by the end. Recommended for action fans who will likely enjoy the thrilling and violent fight sequences like I did.